Billed as a Southern brasserie, Henrietta’s is the flagship restaurant of the new Dewberry Hotel. Housed in the former L. Mendel Rivers Federal Building overlooking Marion Square, the building’s exterior retains much of its bureaucratic severity, while the revamped inside boasts a sleek, mid-century modern redo. The restaurant itself has a casual look, with open-back bistro chairs and a black-and-white checkered tile floor, but the frequently changing, limited menu is decidedly upscale France-meets-New Orleans. Surveying the trio of chilled shellfish appetizers on the menu, the crab remoulade ($18) begged for my attention. 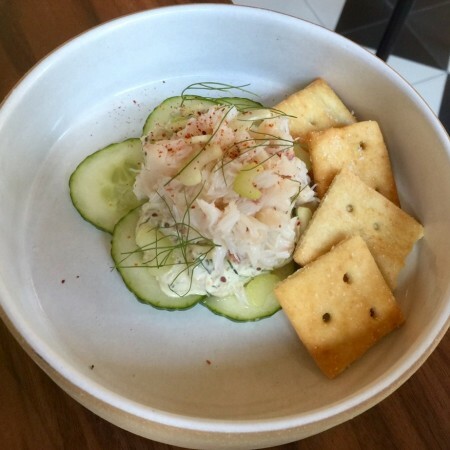 Replete with pickled cucumbers, onions, celery slices, and mustard seeds, the generous portion of remoulade has a busy tartar sauce-quality that overwhelms the delicate blue crabmeat. Accompanied by some superlative house-made butter crackers — the love child of a shortbread cookie and a Keebler Club Cracker — this is so close, and yet not even. I’d suggest taking it easy on the remoulade, as less is arguably more where it’s concerned. In contrast, the country-style pate ($14) was expertly prepared and flavorful, with a garlic finish and none of the crumbly chunkiness that sometimes plagues such preparations. Served with a scoop of piquant pickled mustard seeds, it’s accompanied by baguette slices, as well as spicy pickled green beans, gherkins, and a medley of pickled vegetables. Classically French with a Southern twist, it hits all the right notes. Similarly, the crispy duck confit salad ($19) takes light dining to new levels of decadence. Fresh spring greens and slightly bitter frisee mingle expertly with a vinegar-based dressing. Topped with pickled mustard seeds, rich roast duck meat, a warm poached duck egg, and some superfluous croutons, this dish claims to be a salad, but the title seems too simple. Rich, yet refreshing, it’s simply sublime. The steak frites ($27 lunch/$45 dinner), however, displayed telltale signs of kitchen confusion. Ordered medium rare, but served medium well, this was particularly disappointing, especially considering the meat is served sliced. Topped with a Cafe de Paris butter so chockablock with fresh tarragon it’s almost a French chimichurri, it was difficult to taste much else. The accompanying fries, however, were top-notch: thin, crisp, and perfectly seasoned. Same can be said for the sharp notes of the lemony watercress and frisee salad, a refreshing contrast to the other items. Service is impeccable, and the well-versed staff are always available, but never intrusive. With high-ceilings, lightweight wood furniture, and tile floors, the volume can get a bit oppressive during busy spells, but the polished attentiveness keeps things from feeling too casual. Plus, the menu is always there to raise the bar. Offered as an accompaniment at dinner, four dainty gougeres ($8) pastry puffs are served with a decadent chicken liver mousse. A perfect small appetizer, the dish brings a distinctive French flair. The dinner menu is diminutive with a variation on the steak frites, chicken for two, and a pair of fish dishes. The first, a pan-seared wreckfish ($34),was served with vegetables a la grecque, a continental alias for roasted new potatoes, cauliflower, cabbage, red onion, and cherry tomatoes. Homey yet refined, the fish took about 45 minutes to appear and arrived looking jet lagged and exhausted. Nonetheless, the dry-looking fish remained flaky and rich inside, its buttery flavor somehow reminiscent of fried chicken. If that’s the arguable French influence, rest assured the cuisine of the Big Easy is on full display in the flounder Pontchartrain ($34). 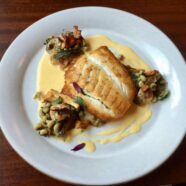 An elegant riff on the traditional Louisiana preparation, the crisp, pan-fried fish arrives afloat a generous swirl of tarragon-infused saffron shellfish sabayon. The deconstructed plating finds the main attraction surrounded by three dainty scoops of elegant Mepkin Abbey mushrooms, fresh black-eyed peas, and small shrimp. Beautifully plated, the dish is both delicate and luxurious, while the pan-fried fish remains crisp, yet tender. 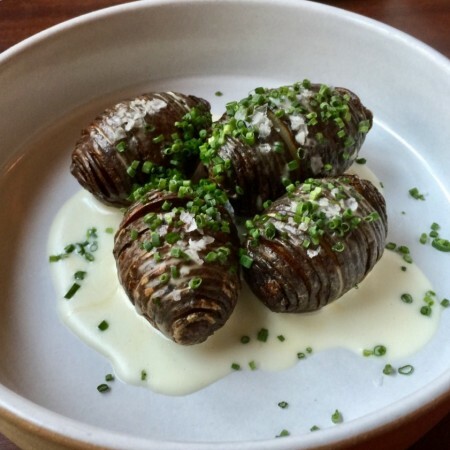 Meanwhile, the accompanying Hasselback potatoes ($8) are a spectacle unto themselves. Named for the hotel in Stockholm in which the recipe was invented in the 1950s, the tiny purple root vegetables are sliced paper-thin and topped with a creamy sheep’s milk mornay, diced chives, and chunks of sea salt. Rich and simple, this rendition evokes a sudden nostalgia for the French countryside. Henrietta’s refined French flavors by way of the Big Easy bring out some of the highlights of both cuisines. Despite some stumbles from the kitchen, the excellent service and over-arching deliciousness ensure the flavors shine and les bons temps rouler.